I’m back with a twist on the Circle Medallion tutorial that I put out some time ago. I guess it never occurred to me that it would be just as easy to make it with a square or rectangle. If you’re tired of going around in circles, here’s another frame type to add to your bag of tricks. Here’s the card I made to test the theory. 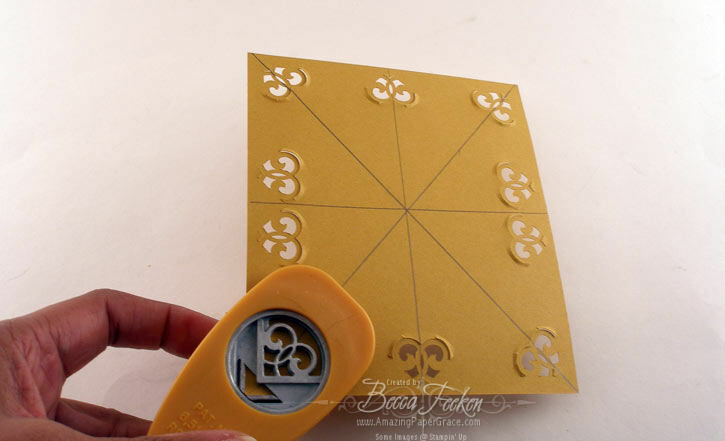 It’s as simple as making the Circle medallion! My sentiment is large so the frame takes up the whole card, but you can make it as small as you like. 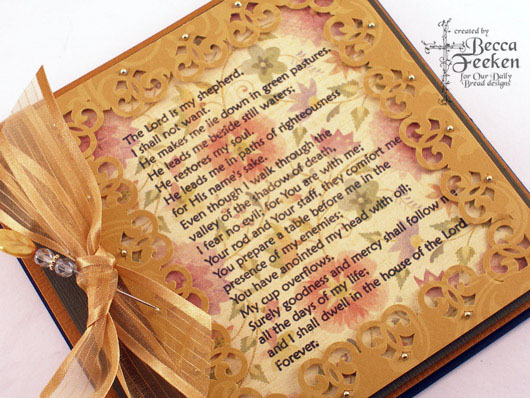 The sentiment I’m using here is one of the newly released stamps from Our Daily Breads Designs and the stamp is Psalm 23. 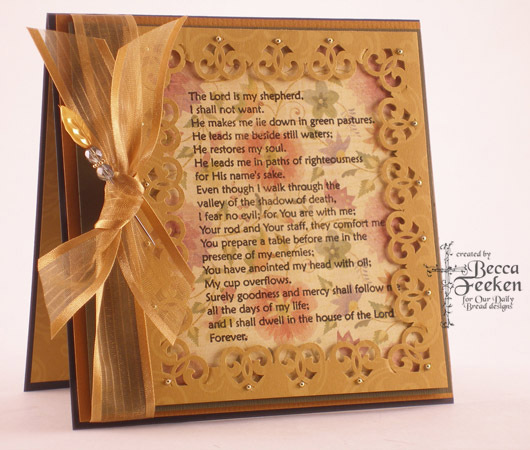 Because the verse has a strong bold font, it can be used in so many different situations and still seen clearly like my in sample above which is stamped onto design paper. 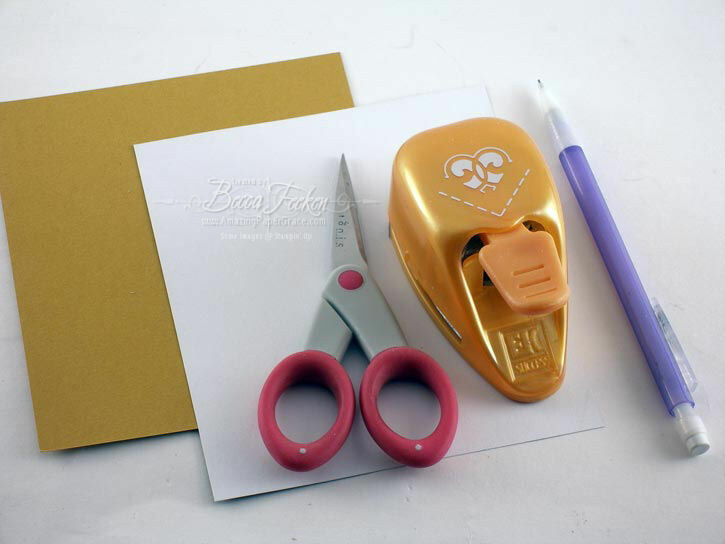 Step 1: You’ll need a corner punch, a pencil, scissors, and two identically sized rectangular pieces of paper. 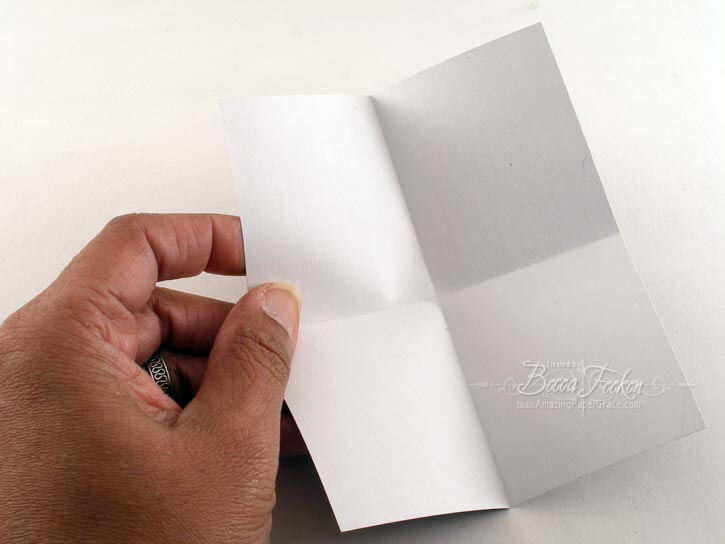 Step 2: Fold the paper into quarters. 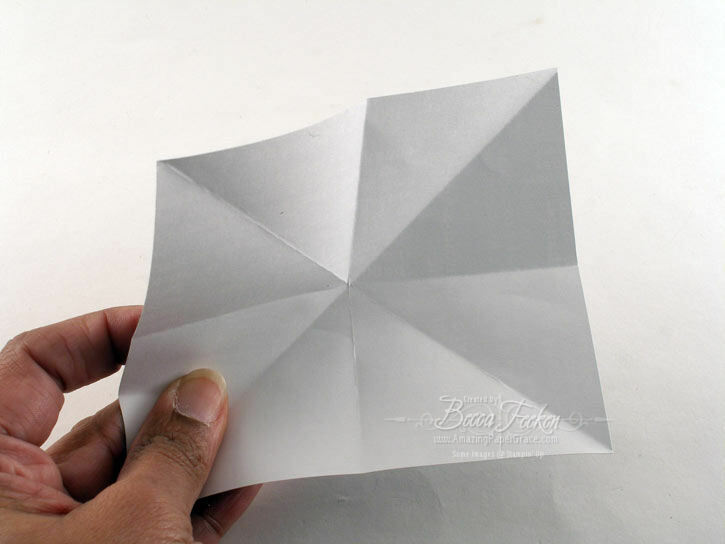 Step 3: Fold paper diagonally, both ways. This will be your template for drawing lines. 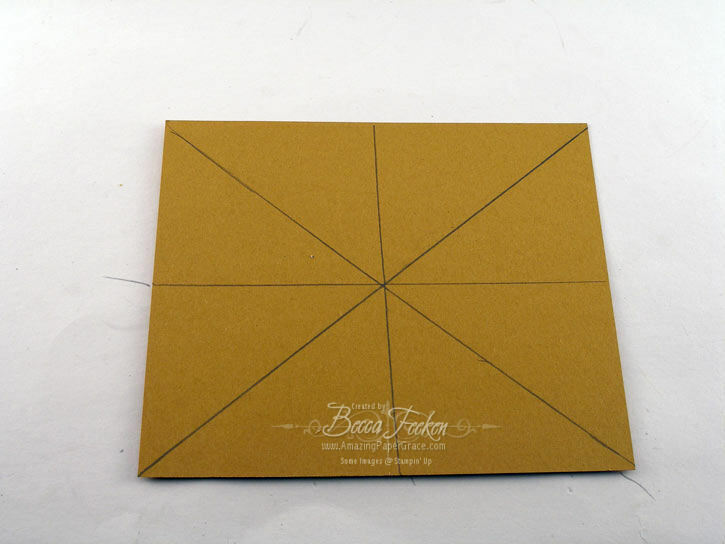 Step 4: Lay your template down on the paper you will be using as a frame. 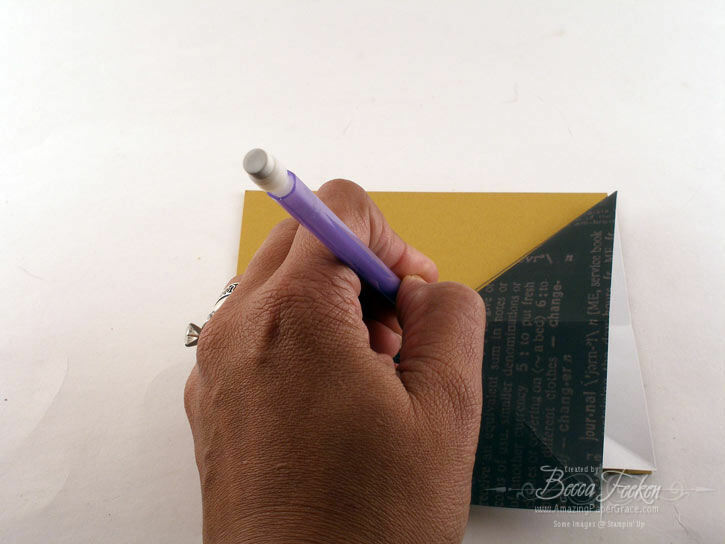 Using each crease as a guideline, take your pencil and mark each of the four lines onto the back of your frame. This is what the back of your frame should look like after you’ve transferred the markings. Step 5: Punch the corners and the center region of each side symmetrically. Please note that punches are sized differently and your rectangle will be a different size from my rectangle. You may have to play around with this to find the best way the punches will fit. Finish off by punching out where you have remaining gaps. 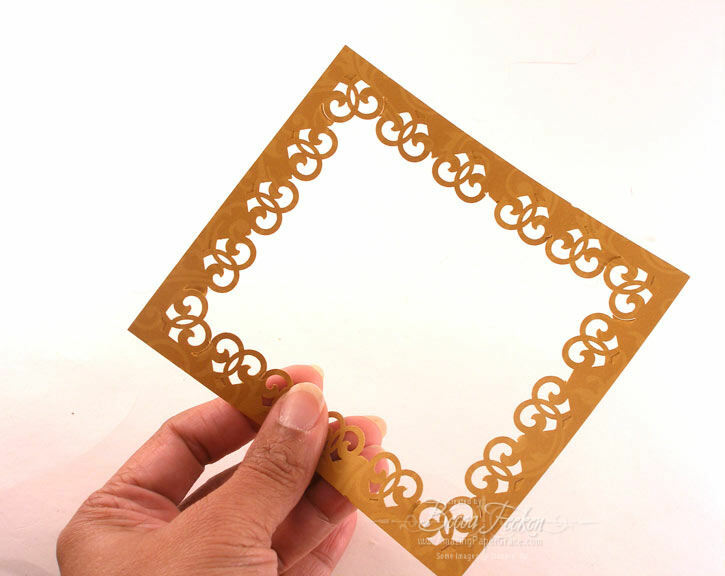 Your frame is now ready for any embellishment you desire and can be added to your card!! I hope you enjoyed this new tutorial! Get adventurous – try any rectangle or square you like! WOW !!! this is one terifc card thank you for your idea’s , how do you think of them all, you must never sleep. I have this punch so I will have a good look at it again, you are one talanted lady thanks again. Becca, WOW!!! I must get me a corner punch so I can do both of these looks. I am finding that the corner punches I have are edge punches and do not work like the type of style you have. Awesome look and thanks for the step by step instructions. Stunning! I am going to have a go. Gorgeous card and great idea. I never thought to make on with a square or circle either. It looks so awesome with that stamp too. That would look great framed on the wall too. Man, I gotta get that Guardian Angel stamp and make one of these for my daughter’s room. Thanks for the great idea! by the way, still not getting your new posts emailed to me. Strange! your cards are always so lovely, cant wait to look on your site daily to see what you have done. thank you for the instructions too. Oh my goodness Becca your card is beautiful. Your colors are awesome and the entired card is just perfect. Thanks for the tutorial too. Amazing!! I NEED to buy that punch now!!! Awesome-as always!! Your work is such an inspiration for me! And I have been able to make some of your projects-they are “almost Becca”!! Becca, you are AWESOME! I love that you’ve figured out all this for me! Two little words that mean so much….. This is a great tutorial – will flag it up on my blog for you if that’s OK – think everyone should see this!!! What a beautiful piece and thank you for sharing the ‘how to’. Such clear and exact instructions. And a great card! Ohh its so beautyful! Thanks for the tutorial! I have been wondering how you do it, now I know! I have an award for you in my blog, Becca! OHH I love it so much! Another gorgeous card! I must say, your cards are absolutely gorgeous. This tutorial is just awesome – just like all your tutorials – what will you have for us next?. Thanks ever so much for sharing your wonderful gift so freely it is truly appreciated. Marvellous Tutorial as always Becca you just keep getting better and better. Thank you so much for being so generous in sharing your wonderful talent. WOW! This is great. I finished my card and you can view it here. It was really fun and looking forward to more of your ideas. Love it. Another beautiful addition. Gorgeous card!!! Thanks for the tutorial. Hi Becca — I really liked the circle punched frame….but I LOVE this rectangle one even more! 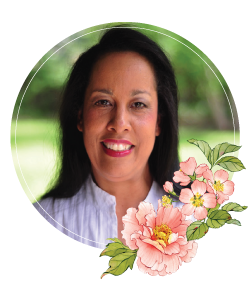 WOW – what an inspiration you are!!! Hi Becca, being a new veiwer of your gorgeous work, I must congratulate you on your use of the EK corner punches, they do make some lovely frames. I was asked at the UK’s, NEC last weekend to pass on your website for them to see the ways you use them and to hopefully show on their own website more uses of them. GREAT TUTORIAL!!! Thank you. It was very kind of you to share your great talent with us. I hope you know how much it is appreciated. You deserve an award Becca. Is there a place I can vote for you? Could you tell me where you purchase your pins and pearls, please?? You have a wonderful talent from God! and you use it beautifully. I love your blog and your creations. This card is stunning. Thank you so much for sharing God’s gifts with others. Wow…what a fabulous and beautiful idea! I am so happy that I found your site. I have many many punches and now have a much better use for them than before…thank You! Great turorial, thanks for figuring this out. This is perhaps one of the most beautiful cards I’ve seen. And to think how simple it is to make.. You truly inspire me. I just found your blog because of the Spellbinder’s Frenzy… but trust me, I’ll be back..
Hi Becca, HNY 2 u & ur family. Would u pls share me with where u purchase ur pins that u use on ur cards r do u make them. Oh my gosh ur cards r my dream fulfilled, I love them & yes GOD has definetley blessed u with a great talent. Thank u n advance 4 sharing the info. Your blog brings me such inspiration.. 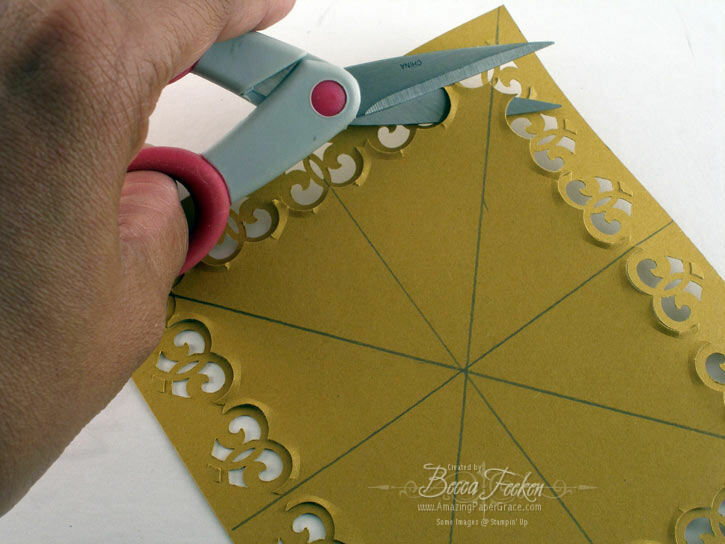 Thank you for the very clear tutorial, I may be able to make a card somewhat like this with your instructions. I wish I had all your punches, spellbinders, stamps and paper and most of all your talent. and it turned out very pretty. I was very luck to have the (wrougth iron) corner punch that you used. Thanks so much.